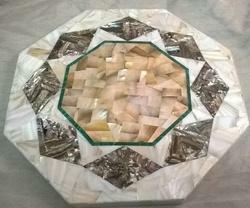 Prominent & Leading Manufacturer from Agra, we offer marble inlay tops. By utilizing our great experience in this industry we are presenting Marble Inlay Tops. We have a large number of products but this product is special in terms of its quality. This product is made up of high quality cloth and raw material. These tops are especially designed by following latest market trends. Our clients has appreciated this product a lot and willing to continue it also. Looking for Marble Inlay Tops ?